Civil rights campaigners have voiced concerns over plans to implement a global biometric identity system for air travellers. The International Civil Aviation Organisation (ICAO) is set to agree an international standard for facial recognition on all new passports. The plans have the backing of the US government and the European Union. It could create a global database of over a billion people by 2015, warned Privacy International. The ICAO standard, being agreed at a meeting in Cairo this week, would require all newly issued electronic passports to have space for additional biometrics such as fingerprinting. "We are increasingly concerned that the biometric travel document initiative is part and parcel of a larger surveillance infrastructure monitoring the movements of individuals globally," said civil liberty groups Privacy International and the American Civil Liberties Union. Millions of air passengers could end up on a computer system that could be accessed by governments across the world, said Dr Gus Hosein from Privacy International. "With the biometric passport, every country may have its own surveillance system, accumulating fingerprints and face-scans and keeping them for as long as they wish with no regard to privacy or civil liberties," he warned. "Governments may claim that they are under an international obligation to create national databases of fingerprints and face scans but we will soon see nations with appalling human rights records generating massive databases, and then requiring our own fingerprints and face-scans as we travel," he added. The US has been routinely fingerprinting and face-scanning foreign visitors since January of this year. 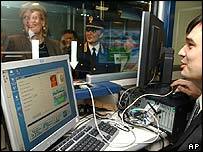 Legislation passed after the September 2001 attacks required foreign countries to create biometric-enabled passports. The US requires that all passports issued after 26 October this year have a biometric identifier. UK citizens with passports issued prior to that date will still be able to go to the US without a visa. 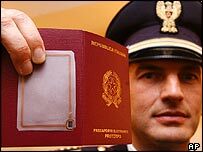 Micro-chipped passports are due to be introduced in the UK in the middle of 2005. Should we carry ID cards?